I, for many different reasons, need an enormous gouge chisel to hollow out logs. I have seen them on YouTube videos and such but they almost always seem homemade and I probably couldn't afford one if they could be sold. But what I do have is a 5 foot long, 1 and 1/4 inch thick, old ground anchor from a mobile home. 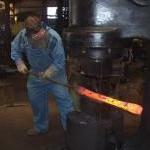 I know I can cut the auger off, heat, and pound a chisel out of one end, but I'm not a blacksmith, I don't know the type of steel this anchor is made from, how to heat treat it, or whether or not it pays to even try. Any advice? Take a look at Baileysonline.com. They have a curved bark spud that might work, depending on what you are doing. They used to have a real deal on slicks, I picked one up a few years back for like $35.00 from them. Reading your post the first thing I though of was getting one of those and reshaping it. I took a look at them, but I couldn't afford it at the moment. Hammering out this ground anchor is my best shot. Welcome aboard VJ glad to have you. If you'll put your general location in the header you might be surprised how many of the gang live within visiting distance. Ground anchors are typically low carbon steel a really poor choice for a chisel of any kind. Either visit a spring shop and see if you can get a spring steel drop or maybe start hitting yard, garage, etc. 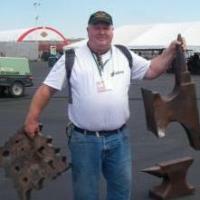 sales looking for largish hammer heads or pry bars. Any of these are typically decent steel in the medium carbon range and can be forged into your log gouge, bark spud, etc. Are you sure that a gutter adze would not be a better tool for the job? A curved adze from an old hammer would be a far simpler project. I had considered an adz, and if I were hollow in logs for a canoe it would definitely be the better option. But I'm trying to hollow logs straight through the center as if for a drum. So my plan is to plunge cut a checkered pattern through the center with my chainsaw to remove most of the wood, then use this "long handled chisel" to remove the rest and smooth it out a bit. 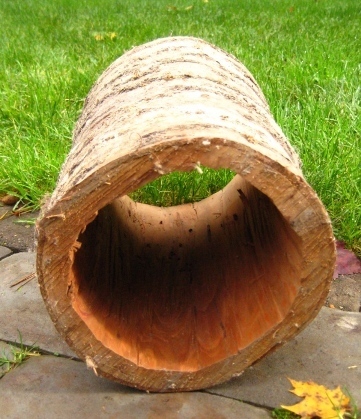 Until I'm left with a log like this picture. Maybe just keep it simple and do the final clean up with a 3/4 in chisel. There are some reasonably priced wood handled ones where you could remove the handle and make a longer one out of a piece of broom stick. You should be able to get it fairly round with that and then sand with thhe sand paper around something round, maybe even a wine bottle. Maybe look up coopering tools. A scorp is use for the insides of barrels. Post your location and there may be someone next door that could help you out. Aw you could do 90% with the chainsaw easily and then all you'd need is a scraper to clean the inside. You can do really clean work with a chainsaw with some practice. Just watch out for the great white . . . birches! funnily enough, I just made exactly such a tool! A lady commissioned it to carve out the inside of logs for beehives. I forged this one from 2x1" slab of O1 tool steel, but I've seen others made by people electric welding a bit of leaf spring to a length of scaffold pole! A chain saw and then an arbortech disc in an angle grinder to tidy up would be my choice. The full arbortech kit comes with a shield which doubles as a depth gauge so would be ideal for smoothing out any irregularities. I bougt one of these together with som scrap iron. I had no idea of what to use it for. It will now get sharpened and a good handle. Dave, that is almost exactly what I need for the exact same reason. Beehives. Even if the metal is mild steel, it will still work...just won't hold an edge for as long as tool steel. If you are just going with the grain like a froe, the edge will rarely be in contact with anything...the split opens up ahead of it....not so good on knotty twisty grain timber. Straight grain as you illustrate though should be okay. You may just have to sharpen it more often. I suppose I should give a bit of background info about myself to help you all understand my situation. I live a mostly self sufficient life out in the woods of Washington parish Louisiana. I moved here from a different parish a few years ago, people here don't like "come-heres" which is their term for someone who wasn't born in this parish. I have no connections to people here, and there's no way I could get into any junkyards or old barns or any other sources of scrap. I am recently unemployed and haven't been successful in finding a job for a few months so all of my savings are used up and I actually owe a few hundred dollars to family and friends. For this and other reasons I am trying to find a way to make a bit of money while I continue the job hunt. Lots of bees around so I decided to build hives and bait them hoping that a few swarms will take over. I need to clear alot of my land of so I plan on selling a few trees to sawmills while using some trees to build a better house for my wife and i, selling firewood, and carving beehives, drum shells, and anything I can make a few bucks off. In spring I will chop up about 4 acres to grow food for my family and to sell at farmers markets. My problem comes from the fact that I have almost NO TOOLS. A chainsaw, two files, a draw knife, a hatchet, a circular saw, machetes, a few hand saws, an electric drill with very few bits, a cheap 40 or so piece mechanics tool set, and an axe head and maul head that I haven't had a chance to carve new handles for yet. 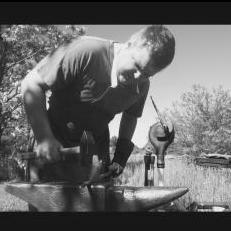 I don't have much of a choice but to learn blacksmithing, I need tools I can't afford to buy. Making the tools i need is my last option at the moment. Otherwise I'll become stagnate and I need to be as productive as possible until I find a job. I can't go without working, I'll lose my mind. Alan, thank you. I figured that was the case, and I don't mind sharpening tools often, I sharpen my knives and hatchet for fun. I just hope I can get a hot fire going today, my airflow was inadequate yesterday. If you can get hold of a bit of scaffold pipe and cut the end off at an angle it would do. If you got a bit of scaffold pipe and cut it in half with an acute angle and a bit of remodelling/ sharpening you would have two gouges for not much more work, and double the amount of carving per sharpening session. You could always improve it with a wooden handle stuffed into the other end, or just use as is, and whack it with a branch wood maul/mallet. No help or ideas from me, but I will say good luck with the job hunt and what you are planning. Keep your head up, something will come along. I suppose I should give a bit of background info about myself to help you all understand my situation. I live a mostly self sufficient life out in the woods of Washington parish Louisiana. Post your location in your information. Washington parish is not quite as standfoffish as you seem to think. Nor is it a rural wilderness. Contact the Gulf coast blacksmiths and you will find people within 50 miles of your location, where ever you are, that are blacksmiths willing to help. You might look up some people from Mississippi Forge council that are just across the border from you. Check with ABANA for addresses and websites. There are posters on this site from Baton Rouge who will help you out. As it happens I've been forging in Southern Louisianan since '89. But I can't get around much these days. Bud, I make frequent trips to my home parish, but when I do my family doesn't let me have a moment to myself. My great grandfather promised me all of his tools and scrap metal before his dementia got bad, but my great aunt stole them before I could. I look around a few places when i go home but people down there use most of their scrap and old tools. I greatly appreciate your kindness. Charlotte. The entire reason I joined this forum was to connect with people so thank you for the information. Mount Hermon in Washington parish is most certainly rural, and I never said wilderness, I said woods. Mostly pine for the timber industry. Everything here is dairy farm or pine trees, that is rural by definition. I might be really late to the ball game here but what about simply burning out the middle? If you set on end and start a fire on the ground it could just burn the surrounding area. Just keep an eye on it and extinguish before its too close to where you want it finished? Might save some time. I'm not a woodworking though I've seen people burn stumps and I think this might work.